My husband would follow me around like a puppy whenever I would use this, so I bought him his own small tub. It's a great size for your purse, bed stand, or desk drawer, affordable enough to keep one everywhere, and extremely plush and comforting on your lips. The gloss itself is thick enough so that I am not constantly reapplying. The reassuring scent and feel are perfect for rough winter days or hot, dry time in the summer. I'm in love! My skin goes crazy in the winter with the dry air, so on a particularly chapped night, I used this before going to bed, and I woke up with really soft, plump lips with no chapping, cracking, or discomfort. Vaseline really outdid themselves with this. The packaging looks just like a regular tub of Vaseline, but in a very miniature form, which is so cute! While this is cute, I personally don't like ...read morehaving to use my fingers with lip products, so for me that was a star off. However, that's just my personal preference. The cocoa scent of this stuff is so. Good. It smells like chocolate and sweet sugar cookies that are fresh out of the oven, which is great for winter. I can't say that it tastes like what it smells like, though. The formula itself is really simple and effective. 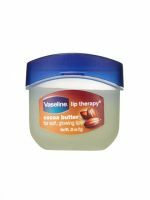 The cocoa butter and the petroleum jelly make my lips really soft and I don't have to keep reapplying every couple of hours. Overall, this is a pretty good product. For about $3, this works better than Chapstick. I do say that I wouldn't wear this in the daytime because it's really, really thick, but it'd be a great overnight solution.